Tripping and falling is one of the biggest dangers facing a senior around the house. You need to go through the home and make sure all electrical cords are tucked away. Any area rugs that could be slipped on should be tacked down or removed altogether. Even something small like a footstool could turn into a tripping hazard. It is better to get rid of it altogether. If your parents are still mobile enough to go up and down the stairs, then you need to make sure the railings are sturdy. If the stairs have runners on them, then they need to be tacked down tightly. You might also want to install motion sensor lights to make sure those stairs are always illuminated. Bathrooms are where most of the falls occur in a home. That’s true for seniors and for everybody else. Grip handles to get in and out of the bathtub are a good idea. Make sure there are rubber treads on that bathtub and of bathmat that won’t be slippery. Nonskid shower mats are a wise investment. It is also a good idea to set the water heater thermostat 120° or below. That can go a long way towards preventing accidental scalding from hot water. Doorknobs that have built-in locking mechanisms like those found on bathrooms or bedrooms could inadvertently be triggered. A lever style door handle is much easier to operate and won’t be accidentally locked. Flashlights should be placed in every room just in case of a power outage. This is a good rule for your house as well. You don’t ever want to be stumbling around in the dark. Along with securing rugs and electric cords, you should also consider removing any excess clutter from your parent’s home. You definitely don’t want to have any exits blocked by furniture or boxes. 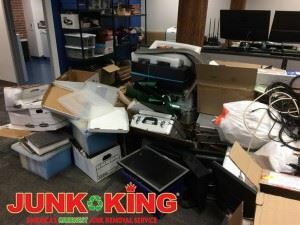 Junk King Houston can be a big asset for this type of project. These are the junk removal pros that provide a friendly moving team for all the lifting and loading chores. It’s a good chance to get rid of heavy objects without lifting a finger. Junk King Houston can also clear out all the clutter from closets, basements and garages. Making a home safe for seniors begins with the decluttering session from Junk King Houston. This entry was posted in Houston Junk hauling and tagged home safe for seniors, Junk King Houston, junk removal on June 30, 2017 by Junk King. Last updated July 1, 2017 .